Specialized Pond Construction of 0.4 acre pond on challenging site. This 0.4 acre pond was constructed on bed rock with a limited water supply. The complete system includes a EPDM rubber pond liner with geotextile underlayment and a 6 ounce non-woven geotextile protective layer. Multiple pond circulation systems are housed in an underground equipment vault complete with debris skimmers, ultraviolet clarifiers, and a multi-chamber biofilter system for nutrient reduction and clarificiation. Native marginal plants provide stabiltiy and habitat on the pond margins. Select native perennial flowering plants provide color throughout the season. After the intial pond design phase over 4,000 cubic yards of bedrock removal was required to prepare the pond bottom for liner. Final pond grade was over-excavated to allow depth for cover on the liner system. An underliner ventilation system was installed to prevent soil gas and groundwater pressure from lifting the pond liner system. Geotextile underlayment is installed to protect the pond liner. 15 foot wide panels are field stitched to form a single, continuous protective layer. EPDM rubber pond liner is then placed over the geotextile fabric layer. The EPDM rubber liner (45 mil) is seamed in place and sealed to the pond outlet pipes, circulation system, and custom skimmer intake. A second layer of geotextile covers the liner for protection and a 6" layer of sand is placed for a completely natural bottom to the pond. 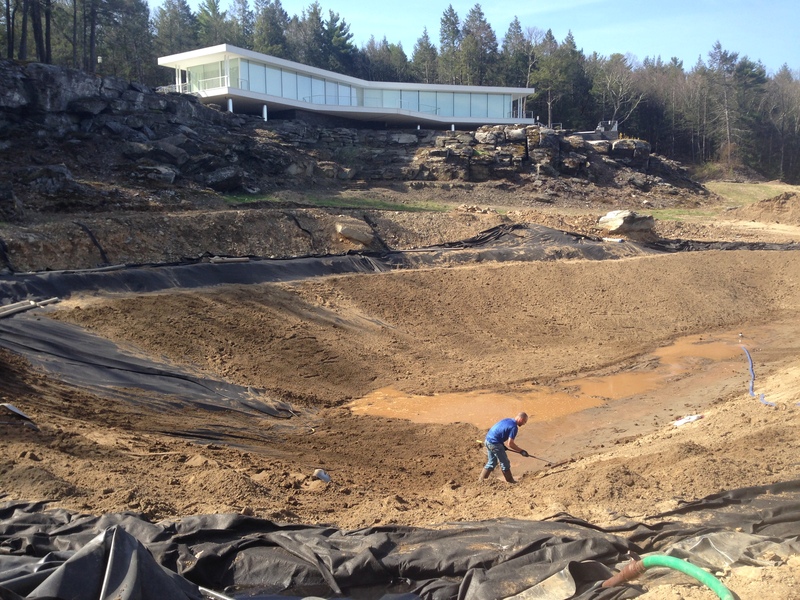 As soon as sand cover was placed on pond liner over 1.2 million gallons of water was trucked in to fill the pond. Over 26.000 gallons per hour of pumped circulation, a custom pond skimmer, 10,000 watts of ultraviolet clarifiers, bottom aeration, and high capacity biofiltration reactors complete the aquatic life support system.